Marine Mammals and Manta Rays – FINALLY! Yesterday we began bringing cores up from one of our final sites for Expedition 342 (less than two weeks left). Little did we know that this site would yield more than just spectacular climate history! First, a giant oceanic manta ray was seen from the helideck. Oceanic mantas, Manta birostris, are the largest rays in the world. Mature oceanic mantas have a wingspan reaching up to 25 feet across and weigh well over 2,000 pounds. Our visitor was feeding in the wake of the JR’s thrusters. Mantas are filter feeders and primarily eat plankton – a single manta ray can consume up to 60 pounds of plankton in one day! In the video on our facebook page you can see two large white remoras affixed to the top of the oceanic manta. These fish use a suction cup like feature on the top of their heads to hitch a ride on larger predators. The remoras then snap up a quick and easy meal as their host feeds. Then this morning two little Short-Beaked Common Dolphins visited the JR. Short-Beaked Common Dolphins are typically found in larger pods, sometimes consisting of over 1,000 individuals. These two probably splintered off from a larger group to forage or investigate the weird noises coming from our big drill ship. It was easy to see them move their heads back and forth as they used echolocation to check out the JR. They even surface and rolled to the side a few times to get a better look before swimming off. One of the two short-beaked common dolphins that investigated the JR. It was easy to see the diagnostic gray and yellow hourglasss pattern along its sides. Just a few hours later we were elated to see MORE cetaceans! This time there was a mixed group of Long-Finned Pilot Whales and Risso’s Dolphins – an awesome site! Risso’s Dolphins and Long-finned Pilot Whales are known to associate with other whales and dolphins. Both feed on small fish and squid at depth, so seeing them together was not too unusual. The pilot whales were difficult to photograph, but we did get a few good looks at the diagnostic wide based dorsal fins of the adult males. 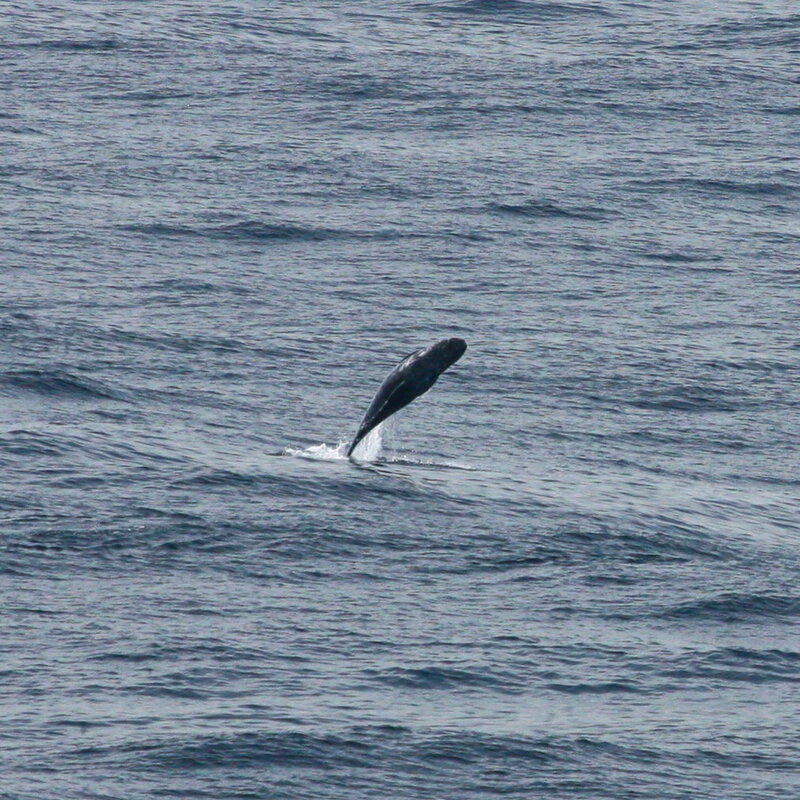 The Pilot whales passed by the JR and gracefully arched their backs, dove deep, and were gone. The Risso’s Dolphins stayed at the surface and passed right by the ship. Risso’s dolphins are large unusual looking dolphins. They have tall hooked dorsal fins and a flat rounded head. They kind of look like they swam into a wall… The group we saw consisted of a few very young calves and adults. Calves are born a dark gunmetal gray color and lighten as they age. The lightening is not natural coloration; they turn white from extensive scarring all over their bodies. These scratches and scars are from other Risso’s, cookie cutter sharks, and squid. Adult Risso’s seem to glow like white ghotsts when they swim just under the surface. We were treated to a few breaches and jumps from both juvenile and adult Risso’s! After three years of working on whale watching boats, this was only the third time I’ve ever seen a Risso’s dolphin breach – so cool! Breaching Risso’s Dolphin! The dolphins back is to the camera. Note the rounded head. Adult and a very young calf Risso’s dolphins.